Our little Judah man is three months old today. Having a child is one of the most unbelievable experiences. Truly…I still can hardly believe we are parents! Now that we have the wisdom of over 12 weeks of caring for a newborn (ha! ), I wanted to share the items that we couldn’t live without! We have used a lot more than these 15 things of course, but these are the things I would most recommend in the first few months of life. None of these products are sponsored…just things we LOVE! 1. A great lactation consultant. This is a little outside the box of the rest of my suggestions, but I just couldn’t address these first few months of motherhood without mentioning the struggle and victory that is breastfeeding! If you decide breastfeeding is the route you want to take, please don’t go it alone. We had some serious difficulties in the first few weeks of our breastfeeding journey that I couldn’t have figured out without the help of our amazing lactation consultant. It made me so passionate about moms finding the help they need. Our IBCLC (International Board Certified Lactation Consultant) made a home visit after our pediatrician expressed concern over one-week-old Judah’s weight loss. The lactation consultant diagnosed him with a lip and tongue tie and helped me come up with a plan to get it corrected and learn to feed my baby. She offered me unlimited email support for weeks following our visit and walked me through every tearful, newbie mom question that I had. If you’re struggling with breastfeeding at all (and it’s something you want to do), then please find a good IBCLC in your area. It’s worth every penny. And if you’re in Nashville, call Leah Brown at Nashville Birth & Babies. 2. Marpac Rohm portable sound machine. We have a Lectrofan sound machine for the nursery (which we also love), but I underestimated how much I would use a portable version! We keep it in the living room in his Rock n’ Play, and we can take it on the go with us. It helps in creating an optimal nap environment! I was so intimidated by this wrap for the first week or so because I wasn’t sure how to tie it! Now that I’ve figured it out, I love it! It’s light weight, and I love the way it hugs my baby in during this newborn season. Judah is a wiggle worm, and he had such a hard time settling down in his crib in the halo sleepsack swaddles we used for the first few weeks of his life. He would happily kick and kick and kick his legs for HOURS. In a desperate move, I ordered the Baby Merlin’s Magic Sleepsuit from Amazon. At $40, it wasn’t a small investment, but it was maybe the best $40 we have spent on him! This funny little marshmallow man getup helps settle him down and keep him settled for night time sleep. 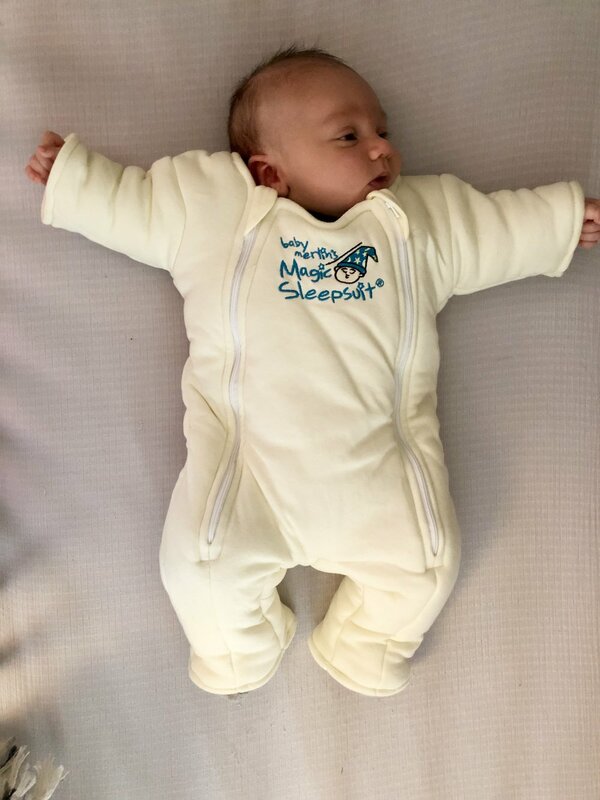 Thanks to intentional scheduling and this magical Michelin man suit, he started sleeping through the night at 7.5 weeks! Go little man, go! Honest diapers are not the cheapest on the market, but they do the trick in a big way for us! They’re adorable, non-toxic, and the best for holding lots of stuff without leaking! He wears them 12 hours at night, and we have never had a leak! There have been one or two poop blowouts, but overall the honest diapers do great work! We’ve also had ZERO diaper rash—which I attribute to the fact that these are chemical free. 6. Uppababy Vista stroller and car seat. A fellow mama told me about this app when Judah was brand new, and we absolutely love it! It’s basically a digital photo album of your baby that can be shared with friends and family. Rather than post daily photos of Judah publicly for everyone on Instagram or Facebook or remember to text family members photos every day, we can create a more private digital picture overload for those closest to us. With all of our extended families out-of-state, this has been amazing! Judah’s grandparents and great-grandparents love their daily Judah update, and I love that I have an easy-to-use chronological timeline of his little life. If you’re looking for a gift that will spoil a new mama, get her one of these robes! And if you are a new mama, get yourself one! My mother-in-law gifted me this robe before Judah was born, and I have used it almost daily! It was great at the tail end of pregnancy, it made me feel a little more put together in the hospital, and I’ve loved it for wearing around the house in these early newborn days. Judah loves the simple Soothie pacifiers, and having a cute stuffed animal attached to them helps it stay in his mouth, helps me find it easily, and just looks so darn cute! Pro: we love them! Con: so does our dog, Todd. We have already replaced the pacifier part on several Wubbanubs because Todd chewed up the silicone. Worth it! I got so many swaddle blankets as gifts, and I wasn’t sure how I could possibly use them all. Let me tell you, I use them CONSTANTLY. Burp cloth, blanket over the car seat, easy swaddle for rock n’ play naps. Those things are so versatile! This cute puppy dog swaddle from Little Unicorn is my favorite! I also love these bamboo swaddles from Bunny Palm. If you are a breastfeeding mama, get one of these! Due to some latch/breastfeeding issues with our little man, I had to exclusively pump for a few weeks, and I will definitely say that a Haakaa doesn’t replace an electric pump (I love the Spectra), but as a supplemental tool for building a stash of milk with hardly any work on your part, this thing ROCKS. In the early breastfeeding days when you have an oversupply, take advantage of it with the Haakaa. I’ll spare you all the details of how to use it, but there is a lot of great info on the internet and some YouTube videos that will help! There’s a reason this is a top rated baby item. I can’t even count the naps Judah has taken in ours! I love that it’s lightweight, portable, and easy to fold up and put away at the end of the day. We haven’t used it for nighttime sleep, but for those daytime living room naps, it was a major favorite. He has recently graduated to taking all of his naps in the crib, but I would still say that the Rock n’ Play was worth every penny! Before we had Judah, I was determined to be as minimal as possible with our baby items. I still try to keep things pared down to the basics so that things can easily be tidied and put away when Judah is sleeping. But, one thing I swore I didn’t need was a bouncer, and I was wrong! Once Judah hit about 6 weeks old, I realized I needed a place for him to sit that wasn’t his Rock n’ Play (since that signaled nap time for him). I ordered this bouncer for less than $20, and we use it CONSTANTLY. In fact, I loved it so much that my mother-in-law bought one for them to keep at their house. It’s simple, lightweight, and easily moved around the house. Now that Judah is awake for longer periods, we basically rotate him from our arms to the bouncer to tummy time and then to this play gym. There are lots of baby gyms on the market, but I love this one because the wood and primary colors are so classic and classy! Judah started loving this at around 6 weeks old, and he is still going strong with it at 13 weeks. I think we will use it for many many weeks to come. He loves his time “at the gym.” :-) BONUS: It’s less than $35. Such a win! This, obviously, isn’t a baby specific product, but having a hands free device like the Amazon Echo in these early days of motherhood has made me so grateful for modern technology. For setting timers, checking the weather, playing music, etc...all while using both hands to hold, feed, burp, and carry a baby. Alexa is basically the fourth member of our family these days. I hope this list is helpful…whether you have a little one, are expecting one soon, or are looking for gifts for someone else’s baby! We have been really intentional about buying baby things that will get a lot of use and skipping everything else. And, so far, we use pretty much everything we have on a daily basis! Our son, Judah Guyton Quarles, was born on October 16, 2018 at 8:21pm. He was 10lb 3oz and 21.5” long. We are completely smitten by this little bundle, and it’s still hard to believe he is ours! The labor and delivery was a whirlwind—about five hours start to finish. Before too much time passes and my memory fades on all the details of his arrival, I wanted to write and share his birth story for any of you who are interested! I see God’s faithfulness through every step of my pregnancy, labor and delivery. It was the hardest thing I’ve ever done, but I look back now with so much joy! My due date was October 25, and everyone kept telling me that first babies tend to come late, so I had resigned myself to the fact that little man would most likely be coming on my due date or later. Two weeks before he was due, my parents flew into town from Tampa for five days to help finish the basement, get the house organized and prep the nursery. The Tuesday before they came, my chiropractor commented that she didn’t know if I was going to make it through the weekend before having the baby. I tried to shrug it off, but I also told my parents to be prepared to stay a little longer if little man made his arrival while they were in town. I stayed really physically active my entire pregnancy, and those few days with my parents were no different. I was painting walls, cleaning house, and working hard to finish up some projects with clients. Even still, I had no labor signs whatsoever. Other than swelling and general third trimester discomfort, everything felt normal and baby seemed comfortable in place. On Tuesday morning, October 16, I got up at 4:45am to take my parents to the Nashville airport for a 6:15am flight. There were no signs of labor, so I sent them off and told them to prepare to drive back to meet the baby in a week or two. I came home, ate a bowl of Chex, and snuggled back in bed next to Jeremy for a few more hours of beauty sleep. Our birth center, Baby&Co, asked if I would be a test subject for a new ultrasound machine that they were using to train the midwives, so we had an appointment to visit the birth center at noon for a final preview of our baby before we saw him in the real world. We indulged and slept until around 10:30, made a quick smoothie and toast, and headed to the birth center. As we pulled into the parking garage, one of the nurses stopped me and said, “You aren’t in labor, are you?” “Nope. Definitely not in labor,” I laughed. We saw our baby on the screen, but once again, I had no labor signs (or indication that he was bigger than normal). He just looked like a cute, full term baby. With no major plans for the day, we left the birth center and enjoyed a quick coffee shop date before a hair appointment for Jeremy to get a fresh trim. At around 2:15pm, while at the hair salon, I went to the bathroom and noticed that I lost my mucus plug. This is an indicator that labor is coming, but it often happens days (even weeks) before labor starts. Jeremy and I stared wide-eyed at each other as it started to sink in that my body was preparing for baby to come soon (although we imagined we still had several days to prepare). I wasn’t having any contractions, but I knew that if my water was broken, the midwives at Baby&Co would want to help me get into active labor sometime in the next 24 hours. I couldn’t be sure my water had broken until I could check at home, so we made the 25 minute drive to our house (past the birth center) and distracted ourselves with conversations about work and upcoming plans. I was in denial that I was in labor. I was texting clients and making notes on my to-do list! The Baby&Co midwife on call, Liza, instructed us to make our way back to the birth center just to be sure that my water had broken and come up with a plan for the next 24 hours. She calmly reassured me that I would most likely be back home to labor for a while that evening, but it wouldn’t be a bad idea to go ahead and bring my labor bag with me just in case. We didn’t feel rushed, so we took our time getting things ready and in the car. Jeremy ate a bowl of soup, and we decided to make a stop at the Juice Bar on the way so that I could get a quick jolt of energy since I hadn’t had a full meal all day. Once we left the house, I was beginning to time my “cramps”, and it seemed like they were coming every two minutes or so. I was in denial. I thought, surely, these couldn’t be contractions because they were coming TOO FAST. I had to focus, but I could still talk through each contraction. We headed toward the birth center through rush hour traffic and made a smoothie pit stop. I had two or three contractions in the Juice Bar, but I kept a stiff upper lip and barreled through in denial. We got to the birth center at around 5pm, and as I stepped out of the car, I had such a strong contraction that I couldn’t walk inside. Once it was over, I took a deep breath and waddled in, greeted my favorite receptionist, Keeli, and was led to an exam room. During the quick exam, the rest of my water broke (in a gush), we learned I was 6cm dilated, and I had three contractions. They were coming so quickly, and I was no longer able to talk through them. Jeremy and I looked at each other in shock and tried to process how quickly things were happening. We texted our doula to come as soon as possible, and she made her way to us in rush hour traffic. I put on the gown I had packed and slowly walked to the labor suite while Jeremy frantically informed our parents and a few other folks that I was in active labor and this baby was coming quickly! My parents had only been back home for a few hours, but we told them to pack up the car and make the 12 hour drive back to us! By this point, my contractions were intense and so close together that I could barely string a few sentences together before the next would start. I wanted Jeremy right by my side for each one, and he comforted me and coached me through contractions like an old pro. The midwives scrambled to fill the tub and to get me properly admitted while helping to coach me through each contraction. The next few hours were intense and overwhelming, but also some of the most empowering of my life. I pretty much skipped early labor and went straight into active labor and quickly into transition. I expected a long early labor and the chance to gather myself mentally in between contractions; however, by the time I realized that I was truly in labor, contractions were coming so quickly that I could barely take a sip of water or form a coherent thought before the next wave would begin. I kept my eyes closed most of the time and moved from laboring on the toilet (oh that wonderful heated bidet!) to laboring in the tub. As I focused and barreled my way through, two thoughts filled my mind. This is way harder than I expected. I feel so loved and supported right now. There was a time when I yelled, “That pressure, not pain, stuff is crap!” in response to the times I had been told during birth classes to think of it as “pressure, not pain.” It definitely felt like pain to me! I handled some contractions with more stamina than others, but in the midst of the intensity, the exhaustion and the feeling that I so badly wanted just a short break to breathe, I felt so empowered by the team of people around me. There were moments I felt like I couldn’t do it, but I knew that there was no turning back. This baby was coming! After about 2 hours of labor, I was ready to push. The midwives were struggling to find the baby’s heartbeat when I was in the tub, so they asked me to move to the bed for pushing. I pushed for 50 minutes, and it was HARD WORK, but baby boy made progress with each push, and when he came out screaming at 8:21pm—a little over five hours from the moment my water broke—every moment of hard work was worth it. Jeremy was holding my left leg during pushing and watched the whole thing (he was also the recipient of all the birth fluid when baby came out), and his first response was “Wow. That baby is a lot bigger than I expected.” The midwives remarked the same. This was a BIG baby! 10lb 3oz of chubby newborn goodness. Jeremy and I held him tight and reveled in those first moments as a family of three. I so wanted to have an unmediated birth, and as we looked at each other and at our new little bundle, I couldn’t stop thinking, “We did it.” It truly was a WE. Jeremy was my biggest supporter and a top notch coach and cheerleader through every moment of pregnancy and labor. I couldn’t have done it without him. As a result of Judah’s big size, his shoulders tore me pretty badly when they made their way out. First and second degree tears can be repaired at Baby&Co, but my tear was a third degree and it was severe enough to require an anesthesiologist and surgical team, so I prepared to be transferred to Vanderbilt Hospital for a postpartum repair and recovery. An EMS team loaded me onto a stretcher and took me on the five minute ride in the ambulance while Jeremy quickly assumed Dad mode and loaded Judah into his car seat to make the trip to Vandy (all while still wearing his outfit that was covered in every manner of birth fluid. Pro Dad move, right there). I was taken to labor and delivery and introduced to my new team of nurses, and Jeremy, Judah, our Doula, and our Midwife met me in the room a few minutes later. The next few hours were a blur. I met my new nurse, the baby’s nurses, the anesthesiology team who were going to give me a spinal tap for my repair, and an OB team who would perform the repair. It took several hours to get organized for the surgery, and in the meantime, I hemorrhaged and nearly fainted. That was possibly the scariest moment of the whole process! Once I was given the spinal tap, the repair took about 45 minutes. I couldn’t feel a thing below my waist, and I was able to snuggle Judah the whole time. I was determined not to have medication during labor, but once that baby was out, I happily took that anesthesia! The actual repair was the easiest part of the process! My doula, Anna, was an invaluable part of those postpartum hours. She held my hand when I almost fainted, helped rub coconut oil and eucalyptus on my back when I had an adverse reaction to the narcotics in my spinal tap, and was a sweet presence through the evening. We stayed at Vandy for about 36 hours. Despite the fact that a hospital transfer was not what we hoped for in the process, we were so grateful for every doctor and nurse who cared for me and Judah. We felt so well taken care of! Judah is happy and healthy, and we are so in love with our precious boy. Why the name Judah Guyton Quarles? Judah means “praise,” and I feel that word so accurately describes the season of spiritual growth Jeremy and I have walked through during the past year of pregnancy. Also, we knew we wanted a “J” name after his daddy and granddaddy—Jeremy Guyton and John Guyton. We loved the biblical references to the “Lion of Judah” (Jesus) as we pray for our boy to be brave like a lion and to love Jesus! Over and over again, yes. If you live in a city with a Baby&Co birth center location, and you’re interested in an alternative to a traditional hospital environment, Baby&Co is truly amazing. From my regular yearly well-woman visits before I got pregnant through every prenatal visit, childbirth class, and the delivery experience, I wholeheartedly recommend Baby&Co. Not only is the peaceful, beautiful facility an ideal environment in which to give birth, but also the entire prenatal process is fabulous. I love the benefits of a highly trained medical staff and close proximity and relationship to the hospital, but with the feeling of a comfortable, friendly environment. I never wait more than a couple of minutes for an appointment, and by the end of my pregnancy, I felt like every appointment was a visit with friends. We were required, as first time parents, to take a 6-week birth class, and we loved it. I felt so well-informed and educated about every step of pregnancy, delivery, and postpartum recovery. Jeremy and I were given all the tools we needed for success. Even though I had to transfer to Vanderbilt directly after labor, the Baby&Co relationship with Vandy is so well-established that the process was smooth and relatively easy. Would you recommend a doula? Once again, YES. If you aren’t familiar with the role of a doula, she is basically a labor assistant for the mom. The midwife or OB is there to take care of all things medical and make sure that baby comes into the world safely; the doula is there to make sure mama’s needs are taken care of. A doula isn’t a requirement, and she is hired separately from a midwife or OB. Our doula, Anna Baskin with Nova Birth Services, is an angel and felt like having a friend alongside Jeremy and me during the process. As first time parents, having a doula was such a blessing! What did you do to prepare for labor and delivery? I worked really hard during pregnancy to prepare both mentally and physically for labor, delivery and recovery. I exercised (both walking and light weight training at the gym) 3-4x per week throughout pregnancy. I did a lot of pelvic floor strengthening exercises like squats on an upside down bosu ball. I switched from sitting on a desk chair to sitting on an exercise ball. One of the best things I did during my pregnancy was seeing a chiropractor who specializes in Webster Technique (especially designed for pregnant mamas). I can’t say enough good things about prenatal chiropractics! I don’t see a chiropractor normally, but I credit my wonderful chiropractor for helping me with pregnancy aches and pains, helping me recover well from my car accident, and preparing my body for a quick, uncomplicated labor and delivery! She is amazing. If you’re in the Nashville area, check out Dr. Rousseau at KydKyro. She is also incredible for new babies! Would you do an unmedicated birth again? Yes. It was the hardest thing I’ve ever done, but I will do it again. Jeremy thinks I’m crazy, but I know that the benefits outweigh the negatives for me. I also have postpartum endorphins to thank for my rose colored memories of the process. I look back on it as such a beautiful thing! Now would I willingly do an unmedicated birth in a hospital instead of a birth center? I would rather not. I loved being in an environment where not only is an epidural not an option, but the entire space is designed to be peaceful and to help manage pain in a natural way. The midwives are all trained to help you cope and make it through the process of natural delivery. That said, the truth of the matter is that there is no easy way to get a baby out. I have so much respect for every woman who gives birth—medicated, unmedicated, or c-section mamas. Everyone deserves a trophy! Because of my third degree tear, my recovery has been a little bit harder than expected, but now (three weeks later), I’m doing really well! I remember thinking in the hospital that I didn’t know if I would ever feel normal again, but I’m feeling more like myself every day! My worst fear going into birth was that I would have a bad tear...and I did, but you know what? I survived! I know I am the one who actually gave birth, but the labor and delivery process was taxing on Jeremy, too! He was such a rock for me, but I know it was hard for him to watch me in pain. Also, the process moved so quickly that he felt really overwhelmed by it all. Not to mention, he had to take the baby to the hospital without me less than an hour after birth! But despite it all, he entered fatherhood like a pro. Watching him become a dad has been one of the sweetest things in the world. I could cry just thinking about it! We keep reminding each other that we are a team. We are in this together. And we need to keep putting each other first (even before our new little guy). Jeremy is so good at putting me first and taking care of his family. Doing this with him is such a joy. He is the most awesome baby we know. He is laid back like his dad, undeniably adorable, and so much fun to have around already. We have had some eating/weight loss/breastfeeding issues that led to a little procedure for Judah to correct a tongue and lip tie, but we are working through it! Thanks for reading through all these nitty gritty details! What words come to mind when you think about visiting the doctor’s office? How about: bright, beautiful, modern, and inviting? Oh wait, no? Most of the time, a doctor’s waiting room feels sterile, generic, and uninviting. So, when Tennessee Alternative Medicine approached me about helping to design their new space, and they began to describe their vision for a beautiful office filled with natural light, plants, and muted pops of color, I was all in. I have been a patient at Tennessee Alternative Medicine for years. If you’re in the Nashville area and looking for holistic healthcare options, check out the team at TN Alt Med! This entire office building is new construction, so we got to start from scratch. We knew we wanted to capitalize on the industrial feel and bright, airy window light. I channeled “west coast juice bar vibes” in my color selections and material choices. This project could not have been completed without the incredible talent of Broken Compass Woodworking. I sketched out my ideas for the floating shelves, the grid shelf wall, and the receptionist desk, and Kyle made it happen using gorgeous maple. Every single piece was executed to perfection. I say that Kyle is the Clint Harp of Nashville. He does absolutely beautiful work with wood! That receptionist desk has hidden casters so that it can roll if needed, and it moves apart into two pieces. Even still, getting it up to the second floor was quite the feat! The bottom cabinets are simple IKEA kitchen cabinets, and Kyle with Broken Compass Woodworking built the grid shelving on top. In addition to TN Alt Med, this space is shared by several other wonderful doctors and therapists. We created a coffee shop style menu board using small maple pieces and clear acrylic letters. I love the way this turned out! Thank you so much to the team at TN Alt Med for letting me be part of creating this beautiful space! As a first time pregnant mama, there has been a big learning curve of figuring out how to tackle pregnancy well. I wanted to share a few of the items that I've bought throughout pregnancy that have made these 40 weeks easier and smoother. Any other fellow pregnant mamas out there? I want to know your maternity must-haves! 1. Blanqi Maternity Tank Top // Built-in back support, flattering fit, sturdy construction, and breathable fabric. So many wins for pregnant mamas with this tank top! It's expensive, but I think it was worth it for me. I've worn it to work out, over leggings with a cardigan or kimono, and even with my jeans. It is sturdy, a great back support, and makes me feel smoothed out in all the right places! 2. Maternity Full Body Pillow // How in the world do pregnant mamas make it through pregnancy WITHOUT one of these? There are lots of different maternity body pillows, and I'm sure there are lots of good ones! But I went with this Queen Rose Maternity Pillow, and it has been a sleep-saver for me. If you're preggers, just buy one of these. 3. Exercise Ball // I've never owned my own exercise ball before (I've only used them at the gym), but I now roll one all around the house and use it throughout the day! My friend who is a physical therapist recommended I get one to help with pelvic balance and help my body stay aligned in light of some pregnancy pelvic pain that I've had, and sitting on that exercise ball instead of my desk chair (and using one at the gym during my workouts) has been one of the best things I've done for my physical well being in pregnancy! 4. Deep Relief Essential Oil // For headaches, weird back pains, and general pain relief when you're trying to avoid OTC pain killers during pregnancy, Deep Relief has been a huge help for me! I twisted my ankle and got in a car accident during this pregnancy, and having oils that I could rely on for some all natural pain relief has been a major win. 5. Albion Fit Maternity Friendly Swimsuit // I love that I can wear this during and after pregnancy! It isn't maternity only but it has grown with me and stayed comfortable throughout pregnancy so that I feel confident in my ever-changing body...even in a swimsuit! I went with the Wave style in Midnight. 6. Mama Natural Week-By-Week Guide // There are a dozen or so books that I have referenced throughout pregnancy, but this one is the BEST. For anyone who is interested in approaching pregnancy from a natural perspective, this is like "What to Expect When You're Expecting" for natural mamas. I look forward to reading the next chapter every week. 7. Swing Dresses // For the first seven or so months of this pregnancy, I LIVED in my non-maternity swing dresses. Now that I'm at the tail end of pregnancy, I'm finding ruched maternity dresses to be the most comfortable, but for all of those early, I-can't-zip-up-my-jeans moments and the middle, is-it-a-burger-or-a-baby days, swing dresses are cute, flattering, and COMFORTABLE. Old Navy has some of my faves, and as we are headed into the Fall season, I'm loving this button down swing dress. I think I may just need it for postpartum/nursing, too! 8. Spindrift // How can I talk about favorite maternity items without covering my biggest maternity craving? Ice cold, fruity beverages! I've been pregnant in the summer months, and I am always craving something cold and refreshing. Spindrift has been my favorite thing to pull out of the fridge. It's like La Croix...but better because it's flavored with real fruit instead of elusive "natural flavors." Mmm...I think I need to go drink a Grapefruit Spindrift about now. 9. PinkBlush Maternity Floral Wrap Dress // As I’ve entered the later part of pregnancy and watched my body change, I have struggled to find much of anything that I feel pretty in. I slip this dress on and feel feminine, pretty, and comfortable in my own skin. I also love that it’s designed to fit me after baby comes, too! It will be a great nursing dress for next Spring. 10. Gap Modal Maternity Nightshirt // This thing is SO soft, so comfortable, and perfect for sleeping and wearing around the house. I plan on wearing this during labor at the birth center as well, and I know it will come in handy with my robe during those first weeks of newborn care. It is so fun when Instagram friends become real life friends and clients! This couple reached out to Peach & Pine to help pick finishes and make a plan for their master bathroom renovation. We wanted to leave things in their original place while replacing all the finishes. I have to give credit where credit is due; this client took my ideas and did a fantastic job working with subcontractors to implement them. It was a team effort to turn this dated, water-damaged bathroom into a brighter, shinier, happier place! When we started, the room felt dark and smelled like mildew from an improperly installed shower that caused some water damage beneath the drywall. Everything was in shades of beige and tan, and it was time to make some changes! We paired a simple subway tile on the tub and shower with a more decorative marble tile for the floor (I am obsessed with that floor tile!). And we paired simple white finishes with a pop of color for the vanity. It’s all about balance! To simplify the renovation, we kept the original trim color, original bathtub, and original cabinet. We replaced everything around them and it feels like a brand new space! What a beautiful space. Huge shoutout to these wonderful clients for letting me play a part in making their bathroom a place they love to use!